I used this product as part of the Obagi system, from my dermatologist's office. After the full 5 month treatment, I discontinued use of the other products, but still use this every day. The zinc oxide makes me feel comfortable that my skin is really being protected. The office explained that this provides a physical sun block and not just a chemical block. Unlike other sunscreens, this one does n...read moreot make me break out. It's a little thick, but I haven't found a sunscreen I like better. 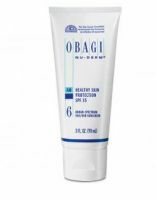 This sunscreen is a very good product and works well with the entire Obagi system. I have never been burned when using this although, I would recommend re-applying if you plan to be in the sun for a lengthy amount of time. Works well. Easily penetrates into the skin without leaving any kind of white on the skin. One of my to go to products.